What is Steampunk? In short, it is a fiction genre that celebrates steam power and machines. Think of Jules Verne and James Blaylock. This style is continued in visual arts and music. 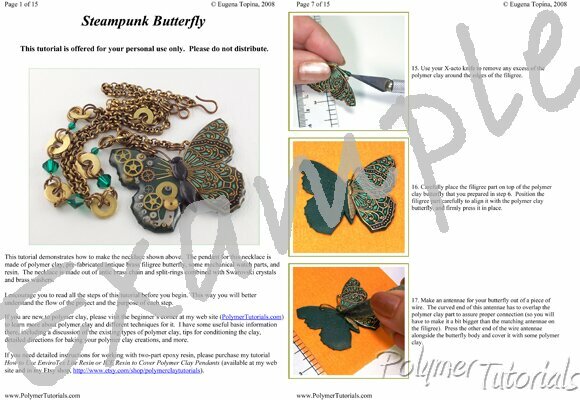 In this polymer clay and resin tutorial, I show how to make gorgeous necklaces with original butterfly pendants. You will need a pre-fabricated filigree part for one wing of the butterfly and some cogwheels from a mechanical watch for the other. Which parts to choose and how to arrange them is your choice, so no two necklaces are ever going to be the same. The color of the butterfly is created using polymer clay. The choice is yours, and you can make this necklace in any color combination you want. The glass-like finish on the pendant is created with resin. The techniques you will learn with this tutorial can be used for many future projects. Think of the possibilities! The first picture on this page shows the project described in this tutorial. Three additional pictures demonstrate some of the possible variations. Place a mouse over the small pictures to see them enlarged. Once again, my first time making this style and it the tutor ..